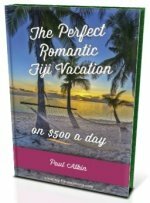 Want to know about the Fiji Times? Find out about the most prominent newspaper in Fiji. From it's history dating back to the 1800's to the present day censorship. The English-language newspaper is owned by Fiji Times Limited. It is the largest and the most prominent daily newspaper in Fiji. The newspaper was established way back on 4th September, 1869 in Levuka the old capital. It has since moved and now has it's headquarters in Suva. In 2010, Mahendra Motibhai Patel purchased the newspaper from Rupert Murdoch's News Corp, after Commodore Frank Bainimarama forced the media magnate out of Fiji. Patel, a convicted felon, is Fiji's top businessman who heads one of Fiji's biggest conglomerates Motibhai and Company Limited, and also is the chairman of Fiji Post. Following the first military coup on 14 May 1987, the Rabuka administration censored the newspaper for a brief time. In response, the newspaper published an edition with large blank spaces where the censored material would have been placed. After the military overthrew the government in 2006, the newspaper again was forced to abide by government censorship, this time by the military. Military officers visited the premises of the newspaper on the evening of December 5 prohibiting any material being published in favour of the overthrown government. This time the paper decided to suspend publication rather than bow down to the censorship. The next day, it was granted permission to keep printing without censorship. 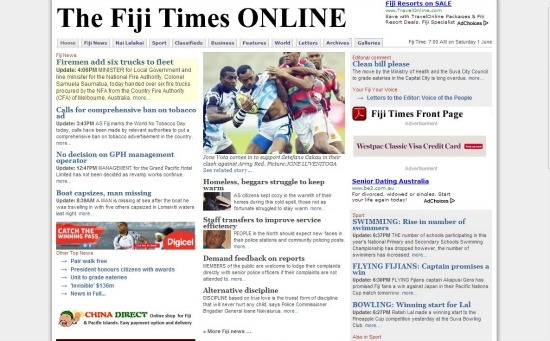 However, due to Fiji's constitutional crises in April 2009, all media in Fiji were censored, including the Fiji Times. Now, there are censors in the newsroom with the online version also being censored since 2009. The daily English-language newspaper has an online version which you can access by clicking the picture below. Topics range from local to world news, classifieds, sports, and business. A Fijian-language section is also available.